Introduction, Copyright notice, User Tips, etc. This is a not-for-profit, ad-free, non-commercial Web site. The (new) Cadillac Database© is owned by the Cadillac-La Salle Club Museum & Research Center, Inc. Neither the CLC Museum nor Yann Saunders (aka "MrCadillac"), who compiled the Database and donated it to the Club Museum in 1999, have any financial interest in the Cadillac Motor Car Division of General Motors Corporation (GM). They have nothing to gain from this site other than the simple satisfaction of sharing with other Cadillac and La Salle enthusiasts throughout the world the vast array of historical and technical data and images contained herein that relate to the beautiful automobiles built by the renowned American manufacturer. Copyright to the bulk of the material included herein is held jointly by Cadillac Motor Car Division, General Motors Corporation (GM), the Cadillac-La Salle Club, Inc. (CLC) and Yann Saunders [aka Mr. Cadillac], its compiler. No part of it may be used for any commercial purpose. The bulk of the illustrated material herein is drawn from the compiler's own, personal collection of some 35,000 photos, ads, sales catalogs and folders, all relating to Cadillac and LaSalle automobiles. That private collection was amassed over a period of more than a half-century and so the provenance of some items may have been forgotten. Should any user consider that copyright on a particular item may have been inadvertently infringed here, we beg your indulgence. We sincerely believe that all the material in The (new) Cadillac Database© has been used fairly and only for its historic significance, not for profit of any kind. If you hold the copyright to any material herein, we will gladly (a) modify the appropriate page, giving you due credit or (b) remove, at your request, any text or image that you believe has been published here without due authority. We do not wish to seriously ruffle anyone's feathers but at the same time we hate the idea of having to extinguish yet another tiny light in the vastness of cyberspace. As a teenager in Switzerland in the fifties, I was smitten by a colorful magazine advertisement I saw in the National Geographic Magazine for December, 1955 that described the new, 1956 Cadillac Sedan de Ville. This was a car like the one Elvis Presley had just bought after he signed his first record deal. I love the raunchy, rebellious rhythm of those early Rock 'n Roll hits and although I cannot sing nor gyrate from the pelvis down, I too wanted a Cadillac, just like Elvis! In 1955, I started to collect these colorful Cadillac ads as well as other promotional literature and product catalogs that I got either from the Cadillac dealership, in town, or during the annual automobile shows. Starting in the early sixties, my "paper" Cadillacs were complemented by a collection of scale-models, replicas and toys that reached epic proportions by 1989, when circumstances outside my control compelled me to sell it. Starting in late 1966, a few full-sized Cadillacs also gave me endless hours of enjoyment; yes, it took me eleven years from the time I saw that first Cadillac ad until I was able to buy my first "real" Cadillac. And, yes, it was a 1956 Sedan de Ville! As my interest in the marque grew, so did the errors I began to notice in books and in magazine articles I would read about the car; this gave me the incentive to start compiling The (new) Cadillac Database©. Today, the Database is a convenient source of reference and information for anyone interested in or who writes about Cadillac and La Salle cars. It contains thousands of facts, figures, pictures and tid-bits that I have gleaned about these cars over the past forty-five (plus) years. In 1993, I was approached by Fabien Sabatés, a French automotive writer, who proposed that we co-author a book on Cadillac styling for the French publisher Auto-Collection. I started to compile The (new) Cadillac Database© with that book in mind. However, Sabatés later reneged on our agreement and left me in a rather embarrassing situation vis-à-vis the many people who had supported the book project and even supplied material for it. Therefore, I would like to dedicate this "virtual book" to the many other people who provided, directly or indirectly, most of the information that it contains. I am making it freely available, through the Cadillac-LaSalle Club Museum & Research Center, Inc., to anyone with access to the Internet. There are no restrictions to downloading for your own, private use any of the files it contains. The job of compiling this "virtual book" was done with relative haste and in the midst of other, urgent, professional and domestic preoccupations. Therefore, errors and omissions are not precluded. I am counting on the users of The (new) Cadillac Database© to point them out so that, together, we can build a bigger and better one. 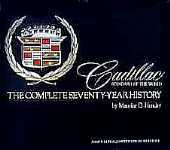 It may be appropriate here to mention the fact that my efforts since the eighties to promote, on the Internet, awareness of Cadillac's long history as a manufacturer of quality, luxury automobiles earned me, in June 1999, the firm's coveted Henry M. Leland award, in October 2000, the E.P. Ingersoll Award of the Society of Automotive Historians and, in August 2001, the Maurice Hendry Award. came to be, then check out this page. The (new) Cadillac Database© deals primarily with Cadillac models built before WW2 as well as those of the first three post-WW2 decades (the forties, fifties and sixties). Tons of information and photos in the collection that relate to the Cadillacs of the seventies and later, still need to be processed. However, owing to work still proceeding on the sections that relate to the earlier models (i.e. Cadillacs of 1902 through 1970), those of 1971 and later are not my first priority, at this time. Perhaps some younger enthusiasts out there might want to volunteer their help to build up the Database from 1971 onwards, along the same lines as I have used for the earlier years. Some sections of The (new) Cadillac Database© are still under construction; additions are being made constantly. At the end of 2011, the site comprised over 8,500 screen-sized pages and more than 40,000 images had been processed. History; I believe there have been 5-6 revisions with updates well into the eighties. This one is still relatively easy to find and I say it is a "must"
This "virtual book" is not intended as a comprehensive nor definitive history of the Cadillac car. It is merely a picture book showing how the styling of Cadillac cars evolved during the first 100 years of production. It will take you from the first runabout model that emerged from the Leland & Faulconer workshops on October 17, 1902, through the hand-finished dream machines of the twenties and thirties, the auto icons of the fifties and sixties, the power machines of the seventies, the aerodynamic "jelly-bean" shapes of the nineties to the razor-edged, space-age designs of the new millennium1. The ratio of images to text pages in this book now is about twenty to one, which is quite the opposite of regular, illustrated car books. Currently [03/2006] there are about 8,500 screen-sized pages covering around 500 topics, sections, or "chapters" grouped under some 30 main headings listed in the home page, and circa 40,000 images! You will see that most of the images in the Database "weigh" between 5 and 15kB and have a resolution of 0 dpi. The experts tell me that, to allow for quality printing, image size should be around 8 x 10 inches and resolution at least 600 dpi. In that format each image would "weigh" around 2MB; in other words, the initial allocation of 20MB (graciously donated by Norm Nicholson, in 1998, would have been entirely consumed by only 10 pictures ...and I want to show you at least 80,000 of them! The new Cadillac Database is hosted graciously by CLC member Glen Houlton of Hawaii. That is why images shown on this site are relatively small and of low resolution. The vast majority of them are in landscape format and are about two inches high; a few are in portrait format; the latter are about three inches high. The low image resolution will not allow for printing but is adequate, in my opinion, for viewing on any good computer monitor. around!) I shall simply add a couple of images of each year's new models. Abbreviations are used throughout The (new) Cadillac Database© to indicate the source of the data herein. Users may refer to the list of these abbreviations by clicking here. The named sources may be referred to for more detailed information on any given item or topic. Compilation of The (new) Cadillac Database© was begun in Europe, so English as opposed to American spelling may sometimes be encountered. In addition, to complicate matters, the date form DD/MM/YYYY also may be encountered, as well as a mix of inches and centimeters (e.g. in the description of Cadillac literature items). Gradually, the switch will be made to U.S. standardized formats. Droits d'auteur, annonces diverses, trucs etc. Vous pouvez lire ceci, ou vous rendre à la page index de la NBDC©. Si vous voulez en savoir plus sur la naissance de la (nouvelle) base de données Cadillac©, vérifiez cette page. Le rédacteur de la (nouvelle) base de données Cadillac© est reconnaissant pour tous les conseils, encouragements et documents quil a reçus en 1994 à Detroit, de la Cadillac Motor Car Division et de la General Motors Corporation (GM). Cadillac, lemblème Cadillac, Seville, STS, Coupe de Ville et De Ville sont des marques déposées de la General Motors Corporation (GM). La (nouvelle) base de données Cadillac© est hébergée à titre gracieux par Glen Houlton, membre assidu du Cadillac & LaSalle Club; Glen habite Hawaïi. Alors que jétais adolescent en Suisse dans les années 50, jai été frappé par une publicité très colorée dans le magazine National Geographic de décembre 1955, qui décrivait la Cadillac Sedan de Ville modèle 1956. Cétait une voiture comme celle quElvis Presley venait dacheter après avoir signé son premier contrat denregistrement. Jadorais le rythme rebelle de ces premiers tubes du rocknroll, et même si je ne savais ni chanter ni me déhancher à sa manière , je voulais moi aussi une Cadillac, tout comme Elvis ! En 1955, jai commencé à collectionner ces publicités Cadillac, ainsi que les autres documents sur ce sujet, que je me procurais soit chez le concessionnaire Cadillac de la ville, soit au salon de lauto annuel. Dès le début des années 60, mes Cadillac de papier se sont vues épaulées par une collection de modèles réduits et de jouets, qui avait atteint des proportions épiques lorsquen 1989 des circonstances indépendantes de ma volonté mobligèrent à la vendre. Depuis la fin 1966, quelques Cadillac grandeur nature mont aussi donné de longues heures de satisfaction. Eh oui, il sest écoulé onze ans entre le moment où jai vu cette première publicité et celui où jai pu moffrir ma première Cadillac « ancienne » ; évidemment, cétait une Sedan de Ville modèle 1956 ! En même temps que mon intérêt pour la marque grandissait, je commençais à remarquer des erreurs dans les livres et les articles que je lisais sur ces voitures ; ce fut laiguillon qui me fit commencer à rédiger la (nouvelle) base de données Cadillac©. Aujourdhui, la base de données est une source commode de références pour quiconque sintéresse à, ou écrit sur les voitures Cadillac ou La Salle. Elle contient des milliers de faits, de chiffres, de photos et autres gâteries que jai glanées à propos de ces voitures au cours des quarante-cinq (et quelque) dernières années, depuis que cette publicité Cadillac 1956 a déclenché mon intérêt pour la marque de prestige de la General Motors. De plus, jai été contacté en 1993 par Fabien Sabatès, un auteur automobile français, qui proposait que nous écrivions à deux un livre sur le style Cadillac pour léditeur français Auto-Collection. Cest avec lidée de ce livre en tête que jai commencé à rédiger la (nouvelle) base de données Cadillac©. Cependant, Sabatès revint sur notre accord, me laissant dans une situation plutôt gênante vis-à-vis des nombreuses personnes qui avaient soutenu ce projet, voire lui avaient fourni de la documentation. Cest pourquoi jaimerais dédicacer ce « livre de substitution », offert à titre gracieux pour consultation permanente pour quiconque a accès à Internet, à tous ces gens qui, directement ou indirectement, ont fourni la plupart des informations quil renferme. Ce travail a été fait dans une relative hâte, et au beau milieu dautres préoccupations urgentes, professionnelles et familiales. Je compte donc sur les usagers de la (nouvelle) base de données Cadillac© pour relever les erreurs ou omissions de sorte quensemble, nous puissions en construire une meilleure et plus grande encore. Il semble ici approprié de mentionner le fait que mes efforts des dix dernières années pour promouvoir la connaissance de la longue histoire de Cadillac en tant que fabricant de voitures de qualité mont valu en juin 1999 le fort convoité prix Henry M. Leland attribué par la marque puis, au mois d'octobre 2000, le prix E.P. Ingersoll attribué par la Society of Automotive Historians (SAH) et enfin, au mois d'août 2001, le prix Maurice Hendry. Ceci est un site web non commercial, à but non lucratif. La nouvelle base de données Cadillac© appartient au Cadillac-La Salle Club Museum and Research center, Inc. Ni le CLC, ni Yann Saunders (alias « Mr Cadillac »), qui a rédigé la base de données et en a fait don au club en 1996, nont dintérêt financier dans la division des automobiles Cadillac de la General Motors Corporation (GM). Ils nont rien à gagner de ce site que la simple satisfaction de partager avec dautres passionnés de Cadillac et La Salle à travers le monde le présent déploiement dimages et de données historiques et techniques à propos des belles voitures faites par le fameux constructeur américain. et ainsi séteindra une autre petite lumière dans limmensité du cyber-espace. La (nouvelle) base de données Cadillac© traite essentiellement des modèles Cadillac construits avant la seconde guerre mondiale ainsi que pendant les trois décennies qui lont suivi (les années 40, 50 et 60). Des tonnes dinformations et de photos de la collection qui se rapportent aux Cadillac des années 70 et après restent à traiter. Cependant, puisquil reste du travail à accomplir sur les sections relatives aux Cadillac de 1902 à 1970, celles de 1971 et après ne sont pas actuellement ma priorité. Peut-être parmi vous se trouve-t-il de jeunes enthousiastes prêts à se porter volontaires pour bâtir la base de données après 1971, sur le modèle de ce que jai fait pour les années précédentes. Certaines sections de la (nouvelle) base de données Cadillac© sont encore en chantier. Aucune base de données ne peut être exhaustive ; celle-ci aussi aura besoin dune mise à jour au fur et à mesure de lémergence de nouveaux faits et de nouvelles informations. Les utilisateurs de la base de données peuvent proposer de nouveaux sujets, de nouvelles données, de nouvelles images. Si la place le permet, ils seront ajoutés en temps utile. Veuillez indiquer lorigine de toute documentation envoyée. D'autres écrivains autrement plus compétents que moi ont écrit dans le moindre détail l'histoire des automobiles Cadillac et La Salle. D'ailleurs, pour apprécier à sa juste valeur le présent "livre au format numérique", je recommande vivement à tous les utilisateurs de la NBDC© de se procurer et de parcourir, au minimum, les livres décrits dans l'encadré (voir ci-dessus). Je ne prétends pas vouloir écrire ni même récrire la grande histoire de la Cadillac; la NBDC entend simplement visualiser comment ont évolué les lignes de la Cadillac depuis la première petite voiturette "Runabout" de 1902 jusqu'aux formes fluides et aérodynamiques des voitures "suppositoires" du second millénnaire, soit environ 100 années au total1. Dans ce "livre", le rapport entre images et pages de texte est d'environ 20:1, alors que dans les livres traditionnels ce rapport est inversé. A l'heure actuelle [octobre 2000] cet ouvrage comporte environ 500 sujets ou "chapitres" lesquels sont groupés en une trentaine de catégories dont on trouve la liste en page index, ainsi qu'environ 28,000 images ...et ce n'est qu'un début. Pour ce qui est des images, l'avantage de la présentation numérique c'est qu'elle permet de les remplacer très facilement lorsqu'une image de meilleure qualité devient disponible. Par ailleurs, l'expérience que j'ai acquise à traiter les images grâe aux logiciels specialisés dans ce domaine me permet d'essayer d'améliorer la qualité des images ajoutées désormais à la NBDC. Lorsque cela s'avère possible je m'efforce, par exemple, de supprimer les objets inutiles aussi bien à l'avant qu'à l'arrière plan, y compris les gens! J'aime bien les gens, mais nous traitons d'autos ici, pas vrai? Comme je l'ai dit par ailleurs, la place m'est malheureusement comptée; pour cette raison les images resteront de dimensions réduites; la plupart sont au format "paysage" [format horizontal] dont la hauteur est d'environ 6 cms; une certaine quantité est au format "portrait" [présentation verticale] et d'une hauteur d'environ 8 cms. Je suis contraint aussi d'avoir recours à un taux de résolution assez bas (45 dpi ou "points par pouce"); cela ne permet guère le tirage sur papier mais suffit, a mon avis, pour bien visualiser les images à l'écran. Vous constaterez donc que la plupart des images "pèsent" entre 5 et 15 kB. Les experts en informatique m'ont expliqué que pour permettre une très bonne qualité de reproduction sur papier, chaque image devrait mesurer environ 18 x 25 cms et avoir une résolution de 600 dpi. A ce format là chacune de ces images "peserait" environ 20MB; aussi, l'espace Web qui m'est alloué gratuitement par Glen Houlton, membre du club CLC et généreux donateur de site The Cadillac Database qui accueille la NBDC, se verrait entièrement pris par une dizaine d'images seulement ...alors que mon souhait est de vous en présenter 80,000! Des abréviations sont utilisées dans la (nouvelle) base de données Cadillac© pour indiquer la source de ses données. Lutilisateur peut se référer à la liste de ces abréviations en cliquant ici. Il peut aussi se rapporter aux sources citées pour des informations plus détaillées sur un sujet donné. La rédaction de la (nouvelle) base de données Cadillac [NBDC] a été entamée en Europe, ce qui fait que dans le texte anglais, l'orthographe anglaise (et non américaine) peut avoir été utilisée. En plus, pour tout compliquer, il peut se trouver des dates du type JJ/MM/AAA ou MM/JJ/AAA, et aussi des mélanges de centimètres et pouces (par exemple dans la dimension des documents). Progressivement tout sera mis aux normes américaines (les utilisateurs qui ne connaissent que le système métrique se souviendront qu'un pouce [one inch] représente 2,54 cms.